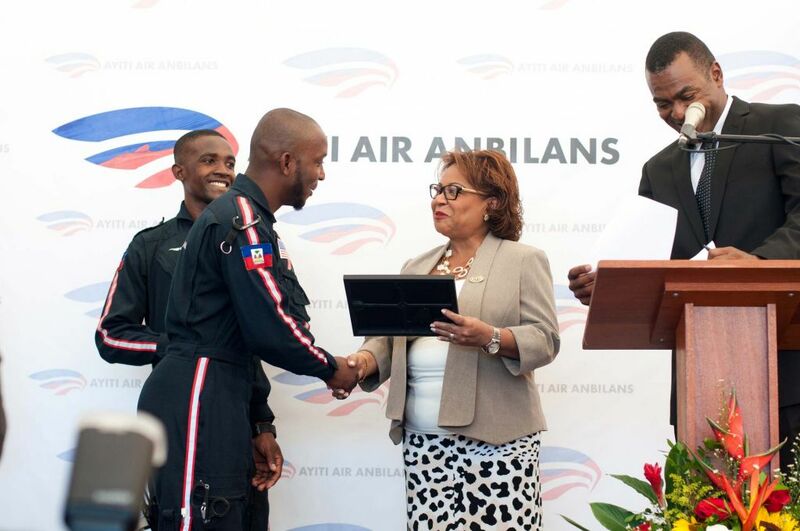 The inauguration of the first Haitian Flight EMTs is a monumental moment in Haiti. Since our inception in 2014, Haiti Air Ambulance has been dedicated to building our team of experienced Haitian personnel. The vision of our founders is to provide world-class medical care via emergency helicopter transport for Haitians, by Haitians. Considering a service like Haiti Air Ambulance has never existed before, we had to be willing to go to any length to fulfill that promise—to be not only the first emergency helicopter transport, but to do so with a primarily Haitian team. Haiti Air Ambulance has been working with leading organizations in the United States to bring the best paramedics, nurses and emergency medical technicians to Haiti to work with our trainees—Claudel Gedeon, Duckens Pierre and Jacquelin Petit—the first in their country’s history to be certified in this capacity. 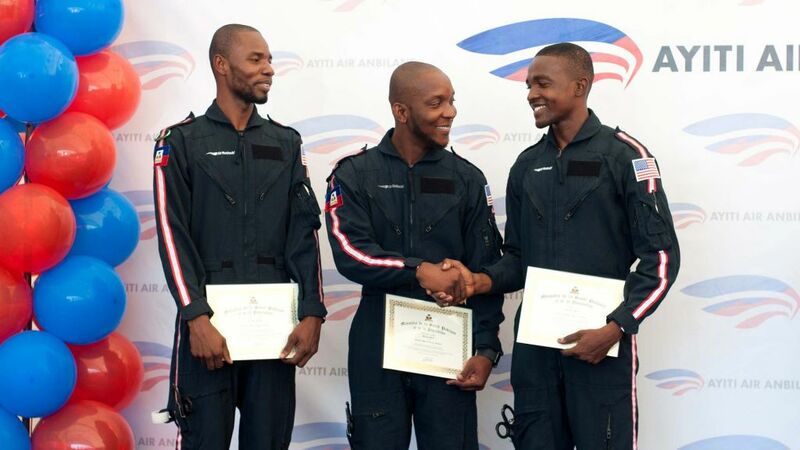 In addition to flying missions almost daily—sometimes twice a day—as Haitian EMT trainees, they followed the stringent US-based National Registry curriculum. The course requires students to know every single thing imaginable about emergency medical care. They must be well-versed in assessment and trauma care and be so thoroughly fluent in common internal medicine emergent pathologies, they could do it under the most stressful circumstances. And of course, in this line of work, there can’t be any mistakes. Added to that, these men had to be able to have an expert grasp on all of this in English, which the curriculum and tests are based in, as well as in their native Creole and French languages that are necessary for performing these duties in the field every day. Claudel Gedeon, Duckens Pierre and Jacquelin Petit are extraordinary young men. Their passion, drive and dedication brings them to our base at the earliest hours and they work until well past sunset. Their focus, care and attention is unmatched. It never fails when a Haiti Air Ambulance crew lands at a scene, the faces of the patients, family and bystanders are filled with astonishment from the visual impact of our helicopters but also for the Haitian faces they see. Our crew often hears, “Ah! They are Haitians!” when they remove their helmets. From here Claudel Gedeon, Duckens Pierre and Jacquelin Petit will continue to fly missions with Ayiti Air Anbilans as we continue our collaboration with Haiti’s care givers, first responders and emergency personnel to provide excellence in health care. Ayiti Air Anbilans flies every day and we now have Haitian flight EMTs ready to take the next steps in becoming flight paramedics and flight nurses as well as sharing knowledge with other young Haitians so they too can fly. Haiti Air Ambulance has been called a catalyst for improving health care in Haiti, but if that’s so it’s because we are stimulated by the merit and superior care we’re seeing out in the field every day. Claudel Gedeon, Duckens Pierre and Jacquelin Petit represent the future of Haiti. A future we believe in and a future that holds tremendous promise. Claudel Gedeon is just 28 years of age. Claudel is a new father who by day splits his time between working at Hospital Bernard Mevs as a medical interpreter and emergency room technician and his training and work at Haiti Air Ambulance, where he started in January 2014 when the organization launched. Claudel was on Haiti Air Ambulance’s first flight—a maiden mission to transport a critically ill gunshot wound patient from Port au Prince to Cap Haïtien. He is a quiet and gentle individual, but make no mistake about it, he is a sharp technician, never failing to ask the right questions and anticipating the steps needed to care for the patient. Back in August 2014, we were on a mission in the South. The patient was 24 years old and had a head trauma. The crew had to focus caring for the patient but we also had to handle the enormous crowd that gathered to see the helicopter. Pierre, without failing his duties as an EMT, single-handedly managed the crowd and helped guide the mission to a successful completion. Duckens Pierre has been with Haiti Air Ambulance since early 2014 and has shown that same gregarious, strong, but amicable nature every day. Any visitor to the base will instantly be greeted with a bright warm hello—in the language of their choice—if he’s present. Jacquelin Petit is only “petit” (“small”) by name. He is one of our most notable crewmembers. 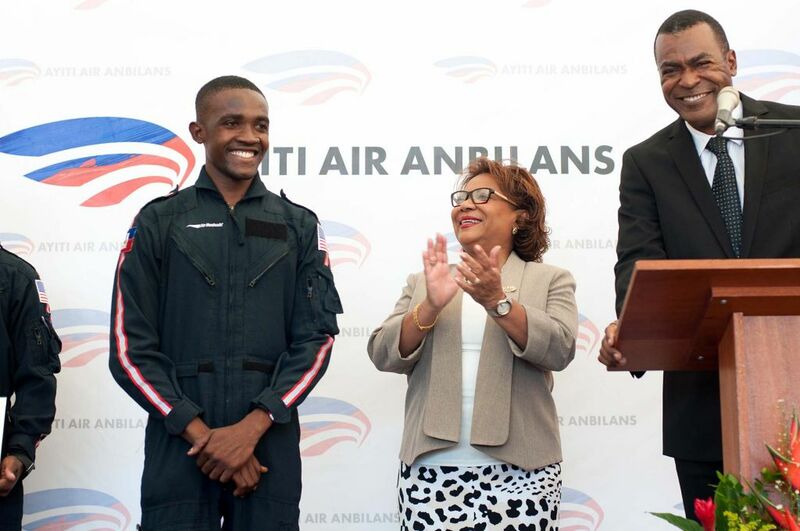 This young and energetic fellow joined Haiti Air Ambulance in April 2014 after his basic training as an EMT with an organization called EMPACT. He also has experience working at the emergency room at Hospital Bernard Mevs where he gained considerable technical abilities. Jacquelin is dynamic, very sharp and he never gets tired! One day, after 3 flights in a row, as the crew was restocking the aircraft, someone jokingly asked him, “Are you ready to fly again?” Without hesitation Jacquelin genuinely answered YES! In January 2014 Haiti Air Ambulance announced its commitment to joining emergency medical services in Haiti by dedicating two state-of-the-art helicopters and assembling one of the world’s top flight teams, crew and mechanics to keep us flying. Just six months later, Haiti Air Ambulance became the first emergency medical helicopter transport service in the country of Haiti! Haiti Air Ambulance flies almost daily, taking those in need of critical health care to the hospitals best suited to provide it. We have rescued mothers, fathers, brothers and sisters, all who returned to their families to continue to contribute to their country in their unique ways. We like to say there is hope in the skies over Haiti, and indeed hope flies daily! From the beginning it has been our mission to collaborate with our colleagues in Haitian emergency services and medical care. Our partnerships with OFATMA, CAN, MSPP and foreign NGOs like Doctors Without Borders and The Red Cross have enabled us to deliver that hope to a network of 48 hospitals throughout Port au Prince and all 10 geographical departments. 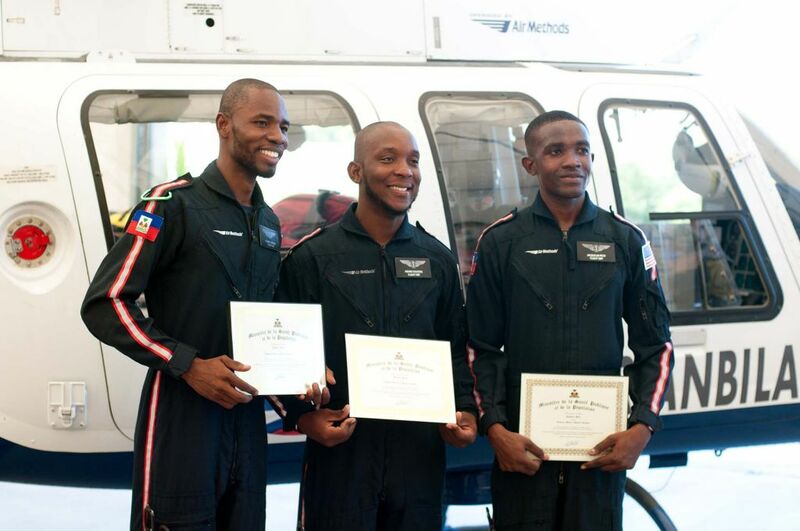 Claudel Gedeon, Duckens Pierre and Jacquelin Petit have been flying with Haiti Air Ambulance since our first flights. 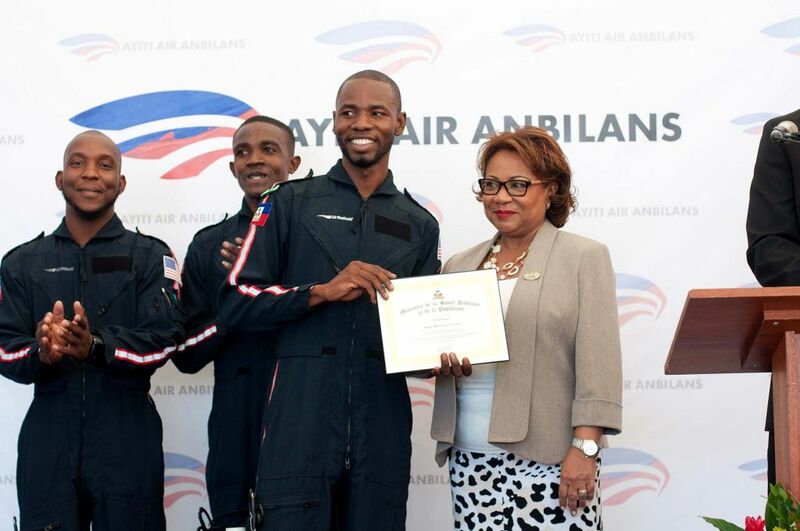 The inauguration of their certification as the first Haitian flight EMTs is a large step forward on a successful path towards accomplishing the Haiti Air Ambulance mission.